Apple released a new operating system Friday, titled Snow Leopard. I'm not sure what the significance of the name is, but I have an idea. From Panther to Tiger and Tiger to Leopard were major changes. However, from Leopard to Snow Leopard was very minor. This may be why the name is so similar. The improvements definitely happened "under the hood" instead of on the screen. One thing is definitely noticeable. My MacBook is running very snappy. Everything snaps. I love it. I can sit down and launch Safari, Mail and iCal and have them instantly. Before, it would take a good 5-6secs to startup. The improvements might not be noticeable on the screen, but the performance under the hood is definitely not invisible. 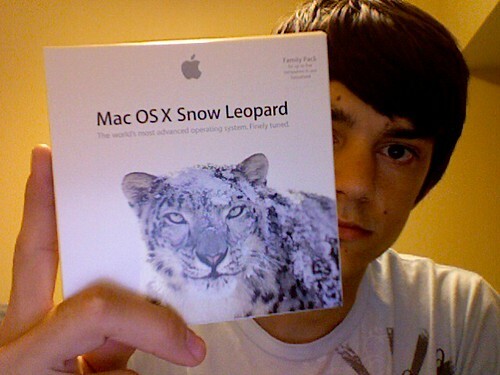 Snow Leopard runs at $29 for a single copy, or $49 for five. Since the improvements are not flashy dramatic features, some people may not be rushing out to upgrade. However, if you have a lot of macs nearby the family pack is definitely a huge deal considering you're bringing five computers up-to-date for less than $10 each.